This is a group review of The Day The Earth Stood Still. Brian, Emerian, and I each watched the movie and developed separate opinions about the film. I am a huge fan of the original, in fact, it is my favorite SF movie. I was surprised how well they pulled off the remake. Brian: It’s not very often that I get a chance to write a review of a remake movie where I can give my praises for a job well done. As the final credits began to roll I knew with great joy in my heart they gave me this opportunity with The Day The Earth Stood Still (2008). This movie was a brilliant remake of the classic film, an excellent example of what speculative fiction should be, and poorly promoted film that will unfortunately get it many bad reviews. I must give my kudos! to Director Scott Derrikson when I read about how he tried to update the movie yet stay true to it’s core message I was very skeptical but he nailed this one and deserves our accolades for a job well done! 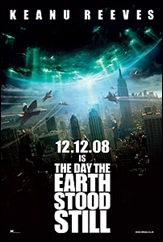 You can read about his approach in Exploring: The Day the Earth Stood Still (2008). Emerian: I have never seen the original 1951 version of this movie. I have to assume it had a better ending than this one. When seeing the title The Day The Earth Stood Still I have to wonder if it meant the moment that the credits rolled and everyone in the theater stared motionless at the screen thinking, "Huh?" Even Roger Ebert, who I usually agree with about SF movies didn’t like the movie. He like many of the reviewers missed the point of the movie. He like most reviewers took the movie as little more than a film with an environmental message, when it is so much more. The Day The Earth Stood still is an “Idea as Hero” story. The idea behind the story is evolution, and whether or not humankind is capable of evolving before we destroy the all life on earth. Throughout the film, Klaatu (Keanu Reeves) witnesses the senseless violence humans perpetrate on each other. The vehicle for the idea is Jacob Benson (Jaden Smith) who through out the movie is engrossed in violent video games and who constantly argues that the aliens need to be killed. Our violence to ourselves, the other animals, and to the world itself is why Klaatu has been sent to earth to preserve a life sustaining world from us. This message is made clearer when Klaatu and Professor Barnhardt (John Cleese) are talking. Barnhardt argues that people can change, but Klaatu is unmoved. He believes that humankind is too lazy and mired in its ways to even try to change. That is the real question. What would it take for people to be willing to change? Brian: Speculative Fiction is supposed to ask a “what if.” To be even better it should also maintain the tradition of making a social commentary of some sort and aspire to humankind’s better nature. Star Wars and Star Trek do this brilliantly it is why those franchises inspire it’s fans to be better then what they originally are. The Day The Earth Stood Still classic also did this with it’s warning about humans violent cold war nature in the 50’s. With great pleasure the 2008 remake also does this by asking what if we are not alone in the universe and how would advanced alien societies see humankind’s behavior. The social commentary is that they would view us as a violent, delinquent child who treats each other as poorly as we treat our surrounding environment. The Day The Earth Stood Still is about how human society lives in a solipsistic state of mind where they treat each other as poorly as they treat their environment and give into their terrible and violent nature. The collection of other alien societies decide that they must save the earth from the humans since there are so few planets in the galaxy that can support complex life forms. Now Helen Benson and her son Jacob must convince Klaatu that humans do have the will to change but only after they are brought to the precipice by a tragedy. Emerian: This film was well cast and I think the majority of the film was worth seeing, but the ending was flat and made little sense. Keanu played a good alien with his emotionless responses. We also get to see him naked and covered with mucus again, which is always a strange but somehow addictive thing to watch. Jennifer Connelly played an adequate smart lady. Jaden Smith showed his ability to stand with his adult counterparts and not be overshadowed in the least. It was also a pleasant surprise to see John Cleese and Kathy Bates. As far as visuals, the orbs are rather interesting and the fly shaped nanobots that go about devouring the land are worth the price of your theater ticket. However, I would advise waiting to see it on DVD. The ending was a big let down and not just to me. As we sat, wondering what had gone wrong, I heard comments from exiting audience members that ranged from unconvincing to anticlimactic. The end of the movie was a call to action. A challenge to the audience. I will deal with the ending of the movie more in a separate post. So who is right about this movie? Was it good or anticlimactic? Honestly, we post are. This film is like music in a particular genre. If you like this sort of movie, you will love it. If you don’t, this movie is not for you. I have read many reviews, and in the majority of them, the reviewers either rejected the message, missed the message, or thought the film should not have been updated. Roger Ebert approached the movie with certain preconceptions that kept him from seeing the message of the movie. It is clear from his review that he did not want to like the movie, and mocked Klaatu for having to learn the lesson of the film. Did you understand and enjoy the ending of Hedwig and the Angry Inch? Did you enjoy Grave of the Fireflies? Did you enjoy the work of Akira Kurosawa? Have you ever enjoyed a book by James Joyce? The fourth one is most important. Joyce believed that a good story should just hold up its object to be beheld by the audience neither pushing them towards or away from anything, and Kurosawa said that a film should have an immaculate reality, allowing the story to just happen without and over abundance of exposition. It’s true art where they bring us to static arrest and hold us there. the message was not so much about ecological concerns but about societies solipsistic attitude (behaving like a spoiled little child with a me me me attitude) leading them to treat their environment as badly as they treat each other. The great balance between the warning about societies current state and the hope of our capability of change. Gort was really well done including a little joke about how he got his name. The Ending: it shows the solution but does not show nor tell the audience that the solution happened it just ends leaving that conclusion up to the audience. The acting was well done. John Cleese was brilliant in his role, I wish they would have advertised this fact. The intro could have done without the first five minutes and just started with the present day. problems of the well written story. The promotion of this film was poorly done, they advertised an action aliens bringing about the end of the world film when in reality this was a thoughtful Science Fiction social commentary film where a lot of the tension is cerebral instead of visual. I could not hear the other classic line “Klaatu barada nikto!” They left the background noise too loud only Keanu Reeves’ mouth moves.